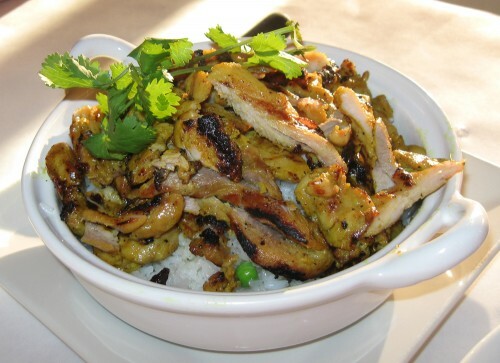 Reading reviews of Lemongrass Thai Cuisine, I’m shocked by how many people love it. Did we go to the same place? Did they change chefs? Are all the reviewers blown away by anything a step above fast food? As we perused the menu, the waitress brought us a bowl of styrofoam. I mean shrimp chips. In pretty colors. With dip. I asked if there was egg (my daughter is quite allergic) and she was sure there was not but offered to show us the box. She was right but, given they were from a box and the list of artificial food dyes in them was longer than the list of the other ingredients, we asked her to take it away. We started with the coconut soup, or at least we tried to. Tom Kha, “coconut soup based seasoned with lime juice, kaffir lime leaves, mushrooms, onions, and carrots.” $8.50 for a large (ordered with 3 bowls) plus $2 for “prawns.” It was served with the rest of the meal, not in the 15 minutes or so while we were waiting. It came with no bowls and the only spoon was a soup spoon, nothing to serve with. 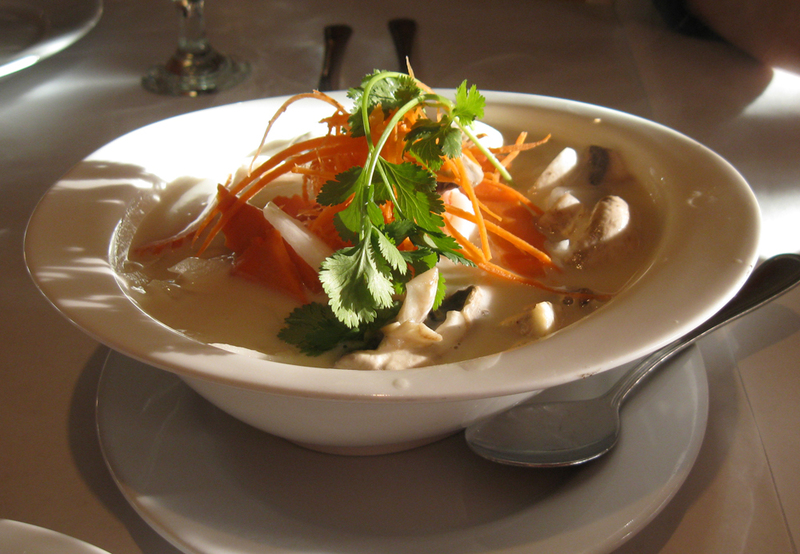 I love coconut soup and order it whenever I get the chance. Picking out all the pieces of roots and leaves that make up the complex flavors is part of the fun. Except there weren’t any. No flavors from them either. The mushrooms were white button, cut in half, the onions were undercooked slices of plain yellow onion, and the carrots were flavorless and too uniformly cut (with scallops) to be house prepped. There were at least a fair number of shrimp (does keeping the tails on turn them into prawns?) for the $2. How do you make coconut soup? 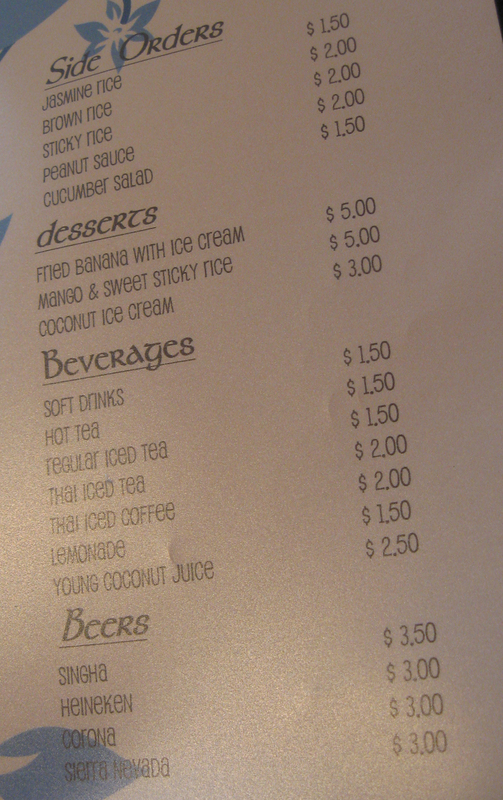 I imagine fresh coconut milk seeped in herbs and spices and tangy from lime. I don’t know what recipe Lemongrass used but it was something like: open cans of coconut milk, add to pot with several cups of sugar, add vegetables, cook until light gel stage. I make coconut ice cream with canned coconut milk and the soup was actually sweeter. Finally, I gave up and asked for fish sauce (which came in a small bowl, tasting mostly of water and salt) and dumped it, plus the “hot” sauce from Michael’s dish into my soup bowl, but nothing cut through all that sugar. Unfortunately, I also ordered a peanut sauce dish. I expect this to be sweet, but it should fundamentally be savory, with complex flavors. Like the soup, it felt more like dessert. 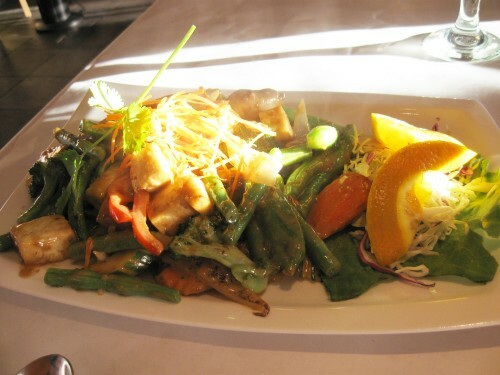 Pad Peanut Sauce, “stir fried mixed vegetables and fried tofu with peanut sauce.” $8.50. More of the same mushrooms, carrots, and onions, plus some welcome nicely cooked green beans, red bell pepper, pod peas, and a bit of raw cabbage. No sprouts, no chopped peanuts, just some cilantro and a slice of orange. We knew this version didn’t come with noodles and we asked for all our dishes to be egg free. The sauce was not thick or cloying, like I feared, but the overwhelming flavor was sugar. We fared a bit better with the other two dishes. Miriam of course wanted some chicken. 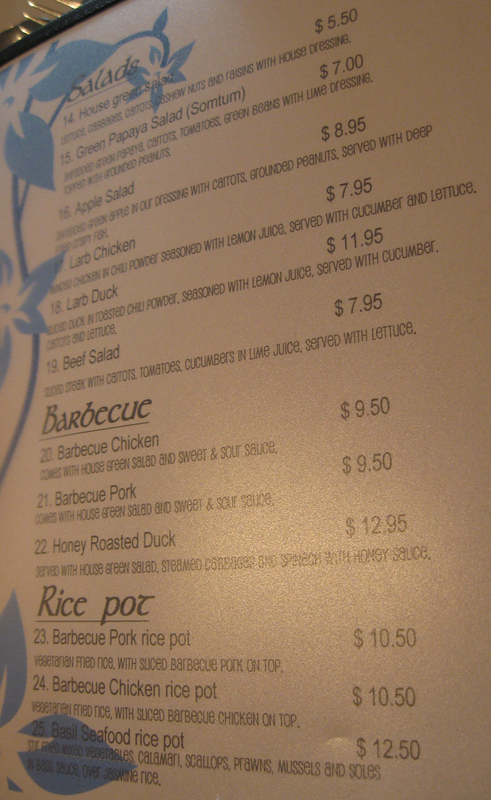 Barbecue Chicken Rice Pot, “vegetarian fried rice, with sliced barbecue chicken on top.” $10.50. Miriam loved the soup and tofu (such a sad comparison to when she was a toddler sucking on a piece of ginger pulled from a bowl of soup at a different, better, Thai restaurant) and ate plenty. She claimed to enjoy this dish but barely touched it. Michael says the chicken was pretty good, though a little bit–surprise–sweet. The oddity was the rice. 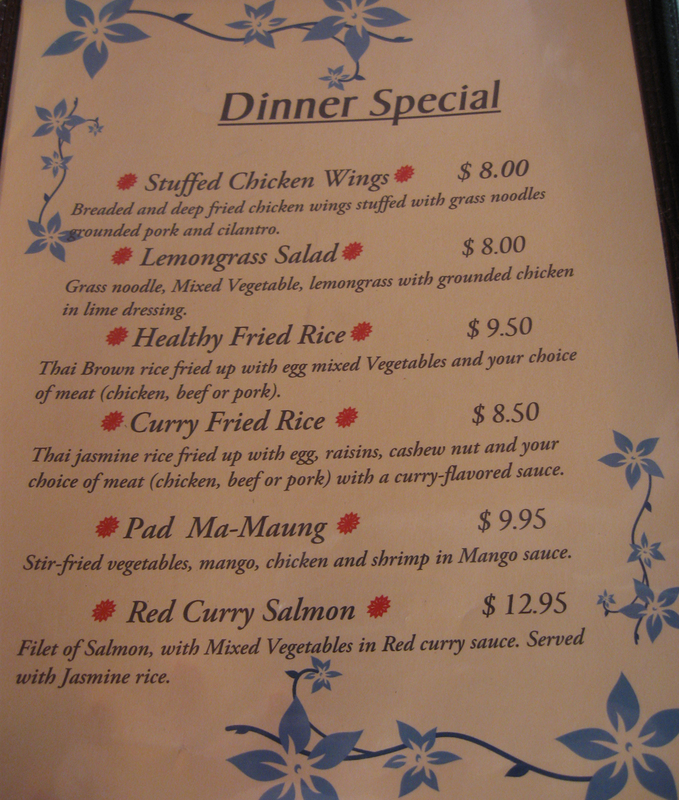 Since we saw brown rice on the menu we asked if they could use it here, done with no egg. Yes, we’ll give you steamed brown rice. 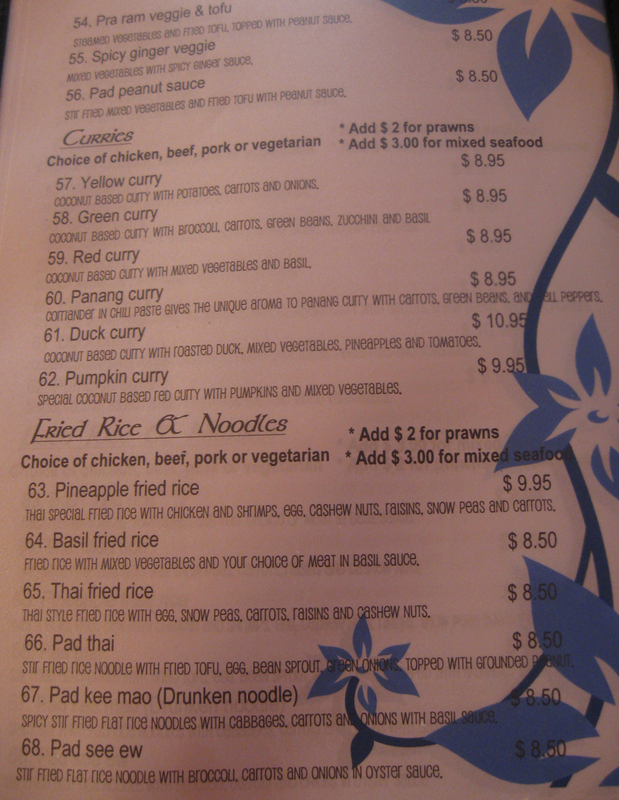 We don’t want steamed rice, we said, the menu says stir fried. They promised they would do it, in a freshly washed pan. So what did we get? steamed white rice with raisins. I’m not joking…raisins. Had I noticed this early enough I would have sent it back. Michael’s dish was the best of the night, though not for him. 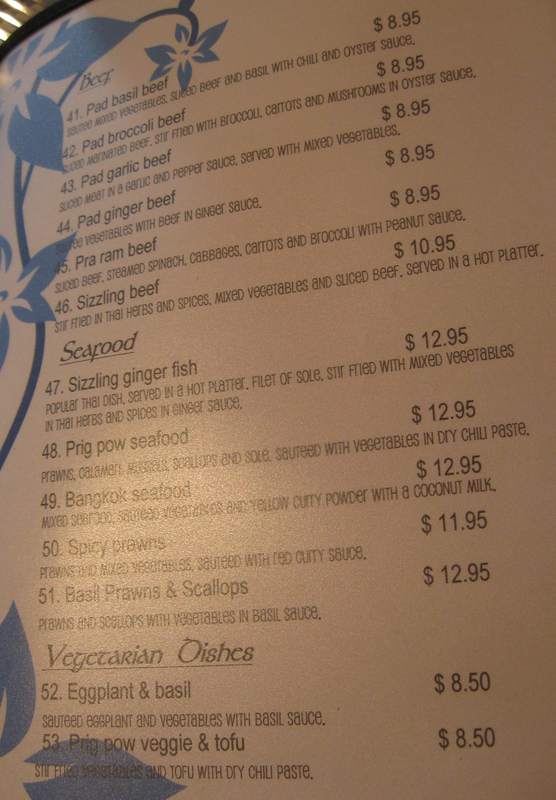 Prig Pow Seafood, “prawns, calamari, mussels, scallops, and sole. 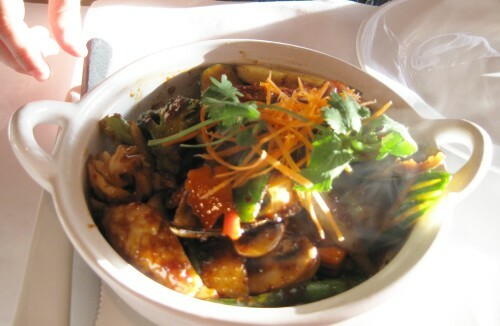 Sauteed with vegetables in dry chili paste.” $12.95. Since it was Father’s Day, I encouraged him to order the dish the way he liked it, even if no one else would touch it. So he asked the waitress (a different one from above) to make it extremely hot. What followed was a comedy of sorts. So no spice? she asked. No, I want spice, make it the way you would for a Thai person, not an American. 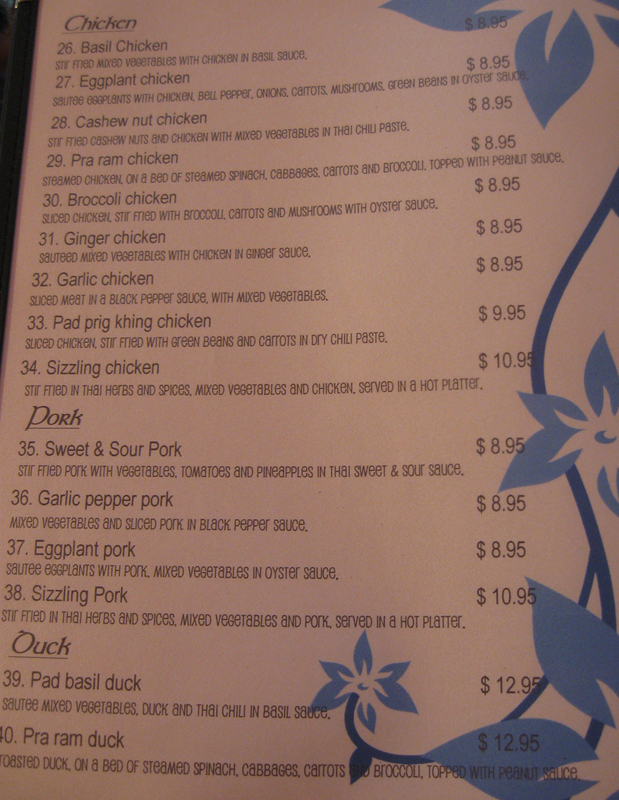 So do you want spice or no spice? Very spicy, he insisted. He ended up with a nice bowl of seafood, some beans, peas, carrot, and cilantro, in a sweet mildly spicy sauce. Mild enough for me to pour into my soup and onto my plate. At least it had a flavor beyond sugar. Most of the reviews I’ve seen talk about the wonderful friendly service. Again, I have to wonder if we went to the same restaurant. The waitresses were nice enough, and always topped up our water, but they messed up the soup and didn’t provide serving utensils for all the dishes (plus included a steak knife with the already sliced chicken). There were no condiments and it took some doing just to get fish sauce. 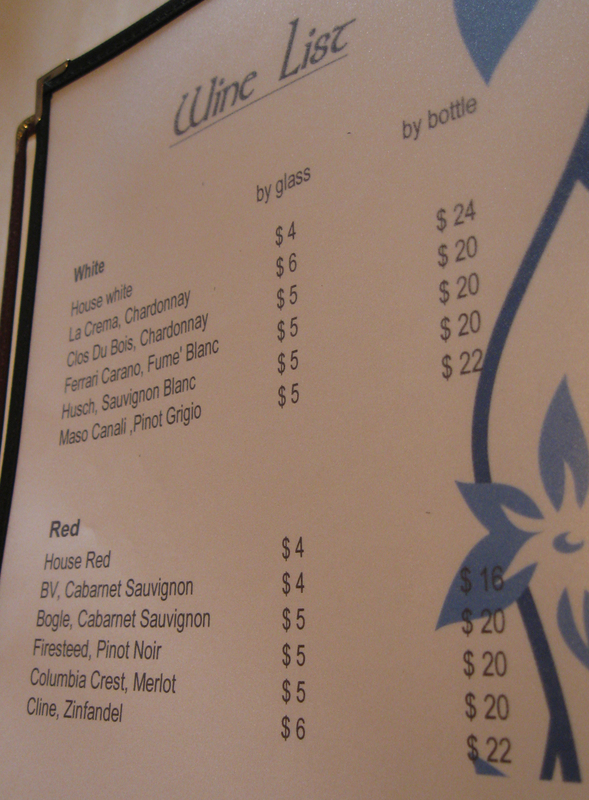 Our primary waitress laughed, actually laughed, each time we asked for something or made a comment. I am sure it was just a nervous titter over her English being so poor she didn’t understand us, but my mind couldn’t help interpreting it as rude. This is how we ended up with things like mild vs hot spices or the disaster which they called rice. Instead of telling us she didn’t understand, or grabbing the other waitress (which she did at times), she nodded and told us it was fine. My guess is that other reviewers have both a higher sugar tolerance than we do (it’s the next day and my head is still buzzing) and happened to hit the better dishes but miss the awful ones. 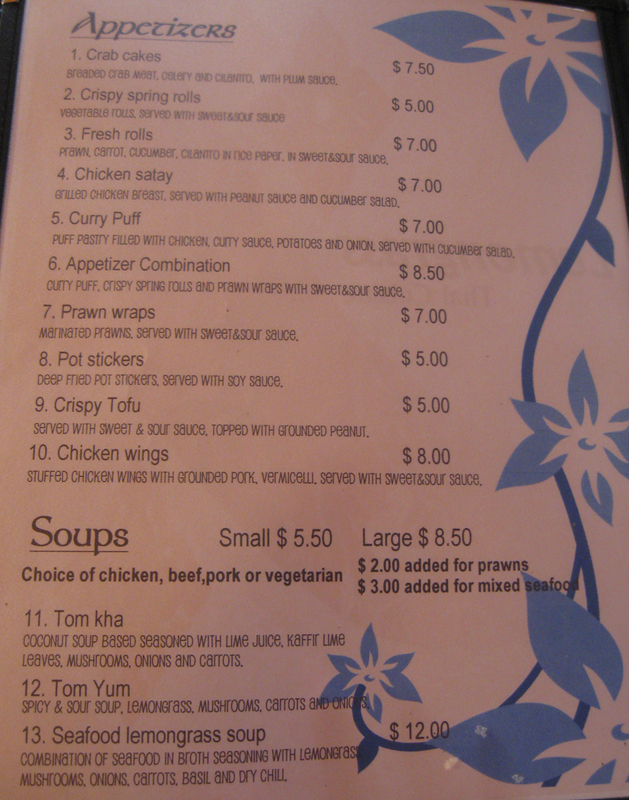 In fairness, it’s a huge menu and we only had 4 dishes. If we hadn’t had the soup, we probably wouldn’t be panning the place so badly. The food was cooked well. The problem was the ingredients.